The state Department of Labor released unemployment figures today -- and they were not good. "Flabbergasted" was the word used by the state labor commissioner. The unemployment rate in the Albany-Schenectady-Troy metropolitan area was 7.1 percent in January. That's up from 5.9 percent in December and 5.1 percent last January. The numbers appear a little worse than they might otherwise look because the labor department includes Schoharie County in the Capital Region's metro area -- and Schoharie's unemployment rate was 11.3 percent in January. The other counties were all between 6.7 (Albany and Saratoga) and 7.6 (Rensselaer). Statewide, the unemployment rate was 7 percent. Nationally, it was 7.6 percent. 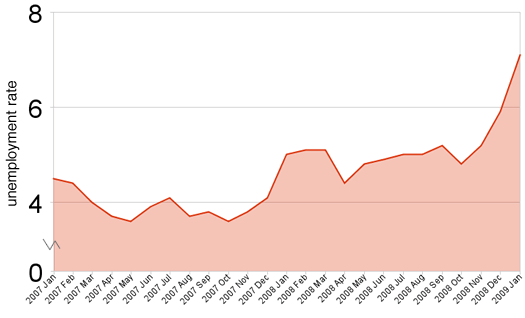 For some perspective, we've put together a 10 year chart of Capital Region unemployment. It really shows how far outside "normal" we are right now. Big chart notes: 10 year data from the federal Bureau of Labor Statistics -- except for the last two months listed. That data is from the NY Department of Labor. Recession data from NBER. Data was not seasonally adjusted. Can someone please explain how unemployment rates are calculated? Is it simply counting the new lot of people who have filed for benefits? And when those benefits run out, but haven't found a job, do you roll right off the list? Abby, no, the unemployment rate includes everybody who doesn't have a job and is looking for one, whether or not they're taking any benefits. It's generally a statistical survey, taken from a sample size. Actually, I believe abby's correct on this one. Once your benefits run out, the government stops counting you. The unemployment numbers also don't take into account chronically underemployed folks.